In 2008, IMAN formally institutionalized the Youth Council as an organizing arm within the youth department. The Youth Council meets once a week and is comprised of 15 youth leaders who have been involved in at least one year of consistent programming. In addition to participating in regular programming, these leaders develop communication and leadership skills, learn more about basic organizing, and engage in dialogue around relevant social issues. Youth leaders will ultimately be responsible for communicating IMAN’s youth work to the public as well as the Executive Board. For the past two months, the youth department has been developing this year’s Youth Council. 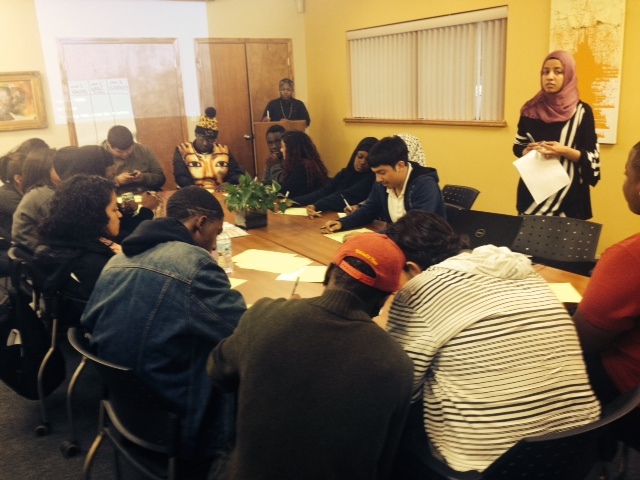 In the safe space that IMAN provides, youth leaders explore the dynamics of power and are pushed to examine how this relates to their role in society. As they discuss effective campaign strategies, leaders are encouraged to form their own opinions and work towards change that not only empowers them, but aligns with their moral values. Based on their strengths and preferences, youth leaders have divided themselves into the subcommittees of Base-building, Social Media, and Foundation Support. Outside of IMAN, our youth leaders have taken the initiative to participate in a variety of community events with our partner organizations, including the Bahar Center’s Walk for Moral Excellence, the annual UCCRO convention, and the recent rally for immigration reform. They are eager to become a visible presence in their communities and role models to their peers. As the weeks continue, the Youth Council will proceed to take ownership of their sessions by further researching and analyzing policy and transitioning into the next phase of their development. We look forward to seeing this cohort blossom into even stronger IMAN leaders in the future, God willing. This entry was posted in Organizing & Advocacy, Youth Services by Farhana Arif. Bookmark the permalink.